(Right Hand) Meets ADA Accessibility Guidelines and the needs of the physically disabled and elderly. Seat is ½” (13 mm) thick, one piece solid, white colored, black core phenolic. Right hand seat with cushion covered in off-white Naugahyde®. Frame, support legs, flanges, and bracket are type 304 satin finish stainless steel. Phenolic seat ONLY is field reversible. 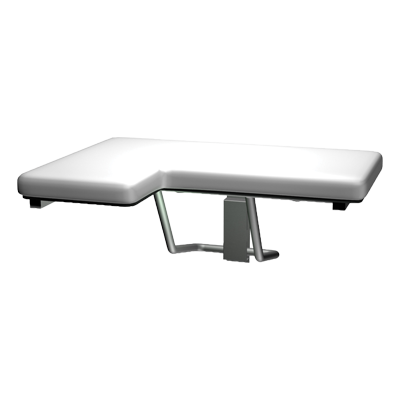 Seat measures 33″ (838 mm) wide and projects 22-7⁄8″ (581 mm) from wall. American Specialties, Inc. reserves the right to make design changes or to withdraw any design without notice.